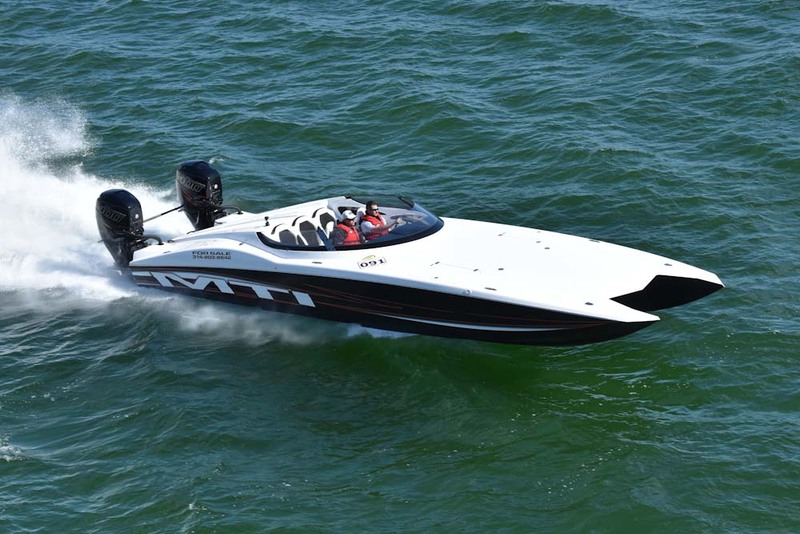 Bringing new ideas to the world of performance powerboating After years of World Championships, record-breaking performances, race wins, and design awards, at MTI, we continue to focus on bringing radical new ideas to the world of performance powerboating. Our ultra modern facilities in Wentzville, Missouri and Green Bay, Wisconsin are staffed by a highly trained team of individuals dedicated to producing the finest performance pleasure and race boats on the market today. Many of the exclusive processes we employ in the Marine Technology product line are the direct result of our extensive experience on the racecourse. MTI President, Randy Scism, began boat racing over 20 years ago in a 20′ Hydrostream Vulture and moved up to larger catamarans before joining the Victory Team in Dubai as general manager and Class 1 throttleman in 1989. The well known Victory Team’s racing heritage was competing in UIM Class 1, Class 2, and Class 3 racing series. During that time, Randy compiled an impressive resume with 10 race wins, 21 podium finishes, and a Class 1 World Championship in 1999. With a wealth of knowledge in design and engineering gained during his time with the Victory Team, Randy formed Marine Technology Inc. in 1999 and immediately started production on the company’s first race boat, which was released in 2001. Opening the new state-of-the-art manufacturing facility in early 2005, MTI’s 55,000 square foot building in Wentzville, Missouri became the corporate headquarters with production, painting, & rigging operation. The Missouri facility boasts a 2000 square foot cross flow painting booth, computerized paint mixing and graphics department, climate controlled post curing area, upholstery shop, computerized parts department, and engineering offices. A second location was added in Green Bay, Wisconsin for lamination processes and continues to lead the industry with the latest in advanced construction techniques. Today, with the production of industry leading V-Bottom center consoles, open cockpit pleasure boats and twin outboard powered catamarans, our brand has become the consumers number one choice for high performance boats. Our philosophy has been, and will continue to be to shape the future of offshore by building the best handling, fastest, and safest offshore high performance powerboats.